Whether you’re going camping with the family, setting up the most badass tailgate with your buddies, or hitting the beach for an afternoon in the sunshine, an outdoor experience is never truly complete without a great grill and barbecue cook-out. It was only during the 50’s when portable grills were adapted and since then, we have been using them. This can be a tall order, since most outdoor grills are too big and bulky to bring along on your travels. This is why we find it is essential to have a dependable, lightweight and easy-to-use portable grill. When selecting the best portable gas grills, we still look for the all-important feature we find essential in the larger backyard grills: powerful heating capability. Solid power combined with portability make up the magic combination for travel-ready grills. Having a poor-heating grill that can be taken anywhere really defeats the purpose for its use, so we recommend purchasing from our list of the best portable gas grills to ensure you get the best mobile grill for your money. Below you can view our meticulously-researched list of portable gas grills, which will give you a thorough overview of what’s available and help you decide which one you should be purchasing. Not unlike purchasing a great backyard grill, you should still be looking over the capacities of a grill in terms of its average BTU, sturdy construction, ease of cleaning, weight and bells and whistles when purchasing a portable grill. Coleman has a well-manufactured Road Trip Grill series that are our top picks for bringing along for tailgating parties or any outdoor activity. The entire series is great, but out of all of them, we have to shine the spotlight on the Coleman Roadtrip LXX. The Coleman Roadtrip LX was a close second, but the double X just barely edged it out with a few exceptional features we just can’t ignore. It is worth noting that the Coleman LX got the highest rating of 4.5 out of 5 in Amazon, but we feel that it won’t be long before its features will be left behind by the newer version Coleman has released, which is why it’s wiser to invest in the LXX instead. The Coleman Roadtrip LXX is fuelled by propane gas, has a cooking surface of 285 sq. inches, which is unusually large for a portable grill and boasts 2 independently-controlled burners with heat capacity of 11,000 BTUs on each burner, totaling a seriously impressive 22,000 BTUs, which is ideal for searing some truly beautiful steaks. It also weighs in at an estimated 50 pounds and has dimensions of 47″ L x 19” W x 34” H when fully assembled. The light weight is great for portability, but the compact design also adds to the LXX’s value as a mobile grill; this little powerhouse can be folded up for transport with a large handle and wheels for easy, rolling mobility. The LXX also comes with the pretty sweet feature of interchangeable cooking grill, griddle and stove grates, which allows you to mix and match your surfaces for a really customized grilling experience. All grill surfaces are also cast iron and porcelain-coated with brushed stainless-steel table inserts. It also features an easily-removable grease tray, which enhances durability and makes it especially easy to clean. The LXX features InstaStart technology for faster and matchless lighting, boasts built-in tool holders, sliding tables and a thermometer for top-level convenience. The listed price of the Roadtrip LXX Grill is $299.99, but you can usually find it for a steal on Amazon at $149.99. You may be required to do a little bit of assembly for the LXX, but it won’t involve a major afternoon of reading tricky instructions and matching screws to a million different holes. Consumers agree that initial assembly isn’t at all difficult to do and the instructions are very clear and understandable. We also love that Coleman offers a 3-year limited warranty for the LXX. You can also purchase several accessories for this model that can help you cook better, save on fuel expenses and protect your grill. And most importantly, Coleman sells a variety of replacement parts for this model that you can easily buy through their website and are still readily available, unlike older models which may have parts that are already discontinued. Other Roadtrip models that are worth mentioning are the Roadtrip LXE and Roadtrip NXT series. The Roadtrip LXE can also be fuelled by propane gas, has 285 square-inches of cooking area and combined BTUs of 20,000. The Roadtrip NXT series came out with a different look, has a larger cooking area of 321 square inches and BTUs output ranging from 15,000 for its older version and 20,000 for the NXT 200 and 300 model. You can acquire a NXT series for prices ranging from $169.99 to $249.99. These Roadtrip models are worth considering if you have a tighter budget, are looking for great cooking power and don’t need all the bells and whistles of the LXX. Get yourself this gas grill using the link below. The Solaire Anywhere Portable Gas Grill is a combination of sturdiness and portability. 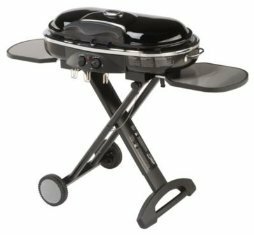 It is made of a heavy-duty 304 grade stainless steel construction and comes with spring-loaded latches to secure the grill during travel, as well as a push-button ignition system for faster and convenient lighting. It boasts 14,000 BTUs, enough for searing steaks and has 155 square inch cooking surface with a stainless steel V-shaped grilling grate that catches drippings to enhance flavor and reduce flare-ups. The Solaire has dimensions of 21” W x 13” L x 12” H and a weight of 27 pounds, making it quite a light carry for a gas grill, nearly half the weight of the Coleman we reviewed above. The Solaire Anywhere also comes with a vinyl carrying bag with three outside pockets for propane tank storage. This grill offers a reliable, hot flame that is perfect for searing, it heats up and cooks food quickly and uses just a little propane in the process. Even when it’s at it’s maximum heat, the handles remain cool to the touch. The only downside of this grill being so hot is that it has been known to burn more delicate items like fish at medium temperatures, so this is one to monitor carefully. You can purchase this gas grill for $389 to $400 with a one-year limited warranty. For an additional cost this grill can also be customized for natural gas conversion, to allow for maximum flexibility. It may cost you a little more now but can eventually save more money in the future. The Magma ChefsMate Connoisseur Series Gas Grill is another portable gas grills worth considering. It optimizes it’s portability with fold-away legs, full-length handle to give access from either side to make mounting easier and an over-sized perfectly-balanced lockable lid to secure all inner components when traveling. Not to mention, the Magma only weighs just 17.8 pounds and has dimensions of 22 x 14 x 13 inches. Extremely light, this grill is especially easy to transport, especially if it’s a long walk from your car to your final grilling destination. We love a lightweight grill when walking across the beach through sand or hiking to the perfect picnicking spot. 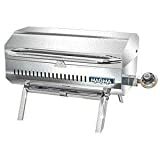 The Magma also has a sturdy construction made from 100% 18-9 mirror-polished stainless steel for maximum corrosion resistance compared with other portable grills. It heats up fast, though not as quickly as the Coleman or Solaire models, with 13,000 BTUs, and has 162 square-inches of cooking surface, which fits the golden average BTU per square inch area rule. It is important to note that the flame has been known to extinguish in high-wind areas, so keep that in mind. The Magma also has great cleaning and maintenance features that maximize its longevity. 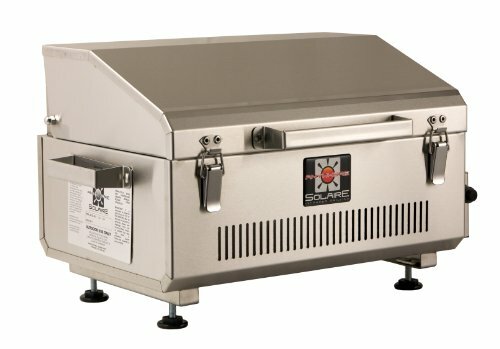 It has an inner safety shell, wherein grease is funneled to a front-access grease tray, reducing flare-up and discoloration, it also has a snap-out radiant plate which allows for a quick, easy clean-up and even heat distribution. The Magma also boasts a swiveling valve/regulator, which allows for a quick and safe gas bottle exchange. And speaking of gas bottles, you can use propane gas to fuel this grill or it can be easily adapted to a natural gas system, allowing for a lot of flexibility. Magma offers a 1-year manufacturer’s warranty for this model. They also offer a wide selection of mounting options and accessories to customize your grill to your liking and individual needs. In addition, you can easily find available replacement parts for this grill to extend it’s life. You can own a Magma ChefsMate Conniosseur Series Gas Grill for the listed price of $299.98 or get it for a steal through Amazon. It also received a high rating of 4.4 out 5 stars from user reviews. There are a few other portable gas grills available that we have chosen not to review here, because they just aren’t quite as well-rated or well-featured as the Coleman, Solaire and Magma models. If you aren’t finding what you need with our top picks, Weber has manufactured its own portable gas grill line-ups that you might also consider checking out. Owning a portable unit may or may not replace a full-functioning grill that you usually use at home, but it is no doubt that these grills can give you the combination of convenience, mobility and power that make any outdoor grilling experience just as easy and satisfying as it is in your backyard. that are truly natural, organic and as close to their original state as possible. claimed they do, then thinning hair would not be considered to be such a big problem.